Quilting is my Down Time: Friday night with friends. Loved joining in with everyone. I spent the time working on my crochet Xmas stocking. 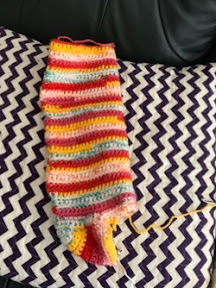 It is starting to look like a stocking. Also this past week we have begun putting up the Xmas decorations. Live rediscovering all my handmade goodies. The stocking is looking great, such bright cheery colors. Your stocking is really coming along - I like those nice happy colors. And Yay for getting your decorations up. That always makes it more Christmasy.